If you’re like most home owners, the brilliant colors of fall inspire you to add some seasonal décor and spruce things up a bit. However, you may not know where to start with your autumn decorating needs. Here are the top ten fall home décor tips to help spruce up your home and make your house the best looking one on the block. A fresh, fall inspired centerpiece sets the tone for your dining room or kitchen. Use different heights of glass jars with colorful leaves inside for an elegant look. For a less formal look, carve a pumpkin and spill fall foliage from the top or out of the mouth of a jack-o-lantern. One of the best ways to spruce up your indoor décor for fall is to decorate your fireplace mantle. Purchase a simple fall leaf garland from a hobby supply store and add glitter with glue for a unique look. Small pumpkins, Indian corn or red and orange candles can add additional interest to the look. Fall is a great time to swap out your ordinary art for something that screams autumn. Take down that old beach print in the powder room and replace it with a painting of a pumpkin patch. Get family photos taken in the fall and display them each year around your home. Hang a blanket that features fall scenes and colors. Another fall decorating idea is to layer different textures of rugs. If you normally keep a fuzzy white rug in your sitting room, add a colorful orange and burnt red rug under it. The rug on bottom should be just a bit larger than the rug on top. You can repeat this in any room for a designer look. While adding visual interest to a home is important, so is the way the home smells. Buyers who enter a home that smells like fresh baked cookies or other scents that recall pleasant memories are more likely to ask for a second showing. Cinnamon brooms are the perfect fall compliment. Not only do they look homey propped in a corner of the kitchen or leaning against the fireplace, but they fill your home with a scent most people love. Add a brightly colored, fall-themed bow to the handle for additional interest. Pumpkins are beyond being simply orange pieces of produce. People have gotten more and more creative with pumpkin decorating. For example, spray paint a pumpkin with black paint and stencil on gold or silver letters and decorations. Use multiple colors on pumpkins of different sizes and arrange them around bales of hay or corn stalks for a welcoming look on your front porch. You can also use painted pumpkins as centerpieces and on your fireplace hearth. When it comes to fall, flowers might not be the first thing you think of for décor. However, sticking to fall colors such as those you see on the trees can be a subtle way to bring fall into your home without spending countless hours decorating. Place large jars or vases in room corners and fill them with branches of fall leaves from your own yard. You can also purchase plastic branches and leaves from craft stores. One idea is to grab several branches from a vividly colored tree that needs trimmed anyway and then tie them together with a pretty bow and place them in a tall vase. A simple welcome mat can add the colors and themes of fall to your home in minutes. Home decorating stores and big box retailers offer inexpensive welcome mats and rugs that you can throw down to welcome visitors to your home. No living room or bedroom is complete without a few throw pillows. Buy pillows in vivid autumn colors and place them on the couch, in a rocking chair and in the master bedroom. Specialty fabric patterns with pumpkins, corn fields or fall foliage should be used in moderation but can add an additional touch that brings the fall indoors. 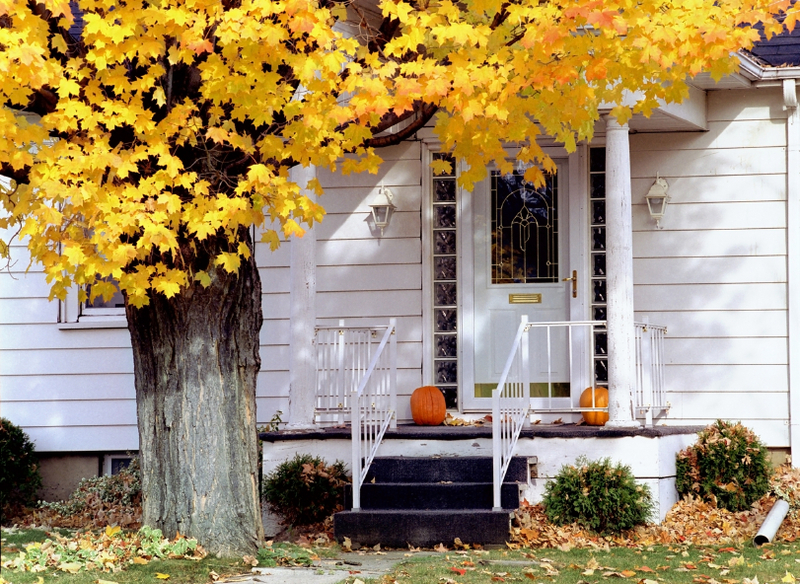 Whether you’re staging your home for potential buyers or just want some ideas to decorate the new home you’re buying, these are just a few of the ways you can decorate for fall. If you’re planning to sell your home and would like some advice on staging, Daniel and Bonnie Wan are an experienced realty team and will give you ideas for how to make you house one that buyers will see through new eyes. This entry was posted in Home Decor and tagged real estate, Real Estate Agent, Real Estate Law, Real Estate Lawyer, Real Estate Marketing, Real Estate Marketing Plan, Real Estate Marketing Tips, Real Estate Tips, Realtor. Bookmark the permalink.